Porter, a 6-year-old male mixed breed dog, presented with a history of lethargy, inappetance, and coughing. On physical examination, skin nodules were noted on the pinna and head. Below are Porter’s diagnostic test results. Review the slides and diagnose Porter’s disease. 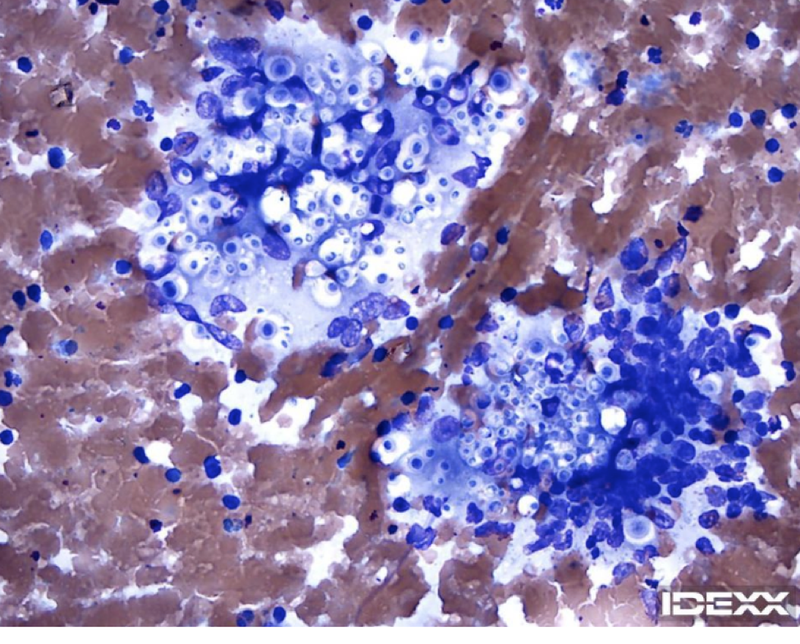 Fine needle aspirate cytology of an abdominal lymph node (Figure 1) and an impression smear from a nodule on the ear (Figure 2) were submitted to IDEXX for evaluation. Figure 2. Impression smear from skin on the ear. 500x magnification. On the cytology slides from both sites, there are numerous yeast organisms present extracellularly and intracellularly in macrophages. These organisms vary in size from approximately 3-12 microns, and many have a thick nonstaining capsule surrounding a basophilic yeast with capsular creases. There are occasional yeasts with narrow based budding. The yeast morphology is consistent with Cryptococcus. 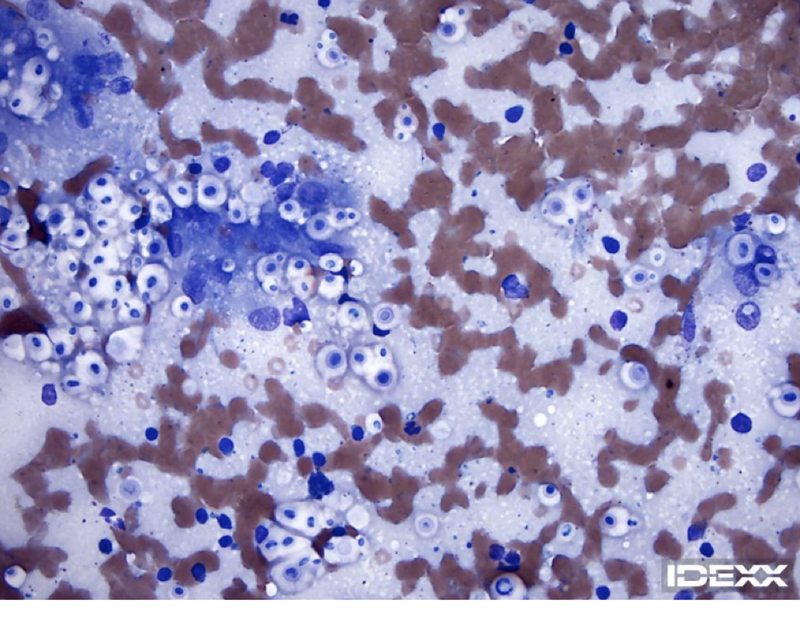 In both sites, there is also a heterogeneous population of lymphocytes with low to moderate numbers of plasma cells and macrophages with occasional neutrophils and eosinophils, indicating a mixed inflammatory response. The presence of yeast organisms in multiple sites indicates systemic Cryptococcosis. Identification of this yeast with characteristic morphology on cytology or histopathology is considered pathognomonic. However, Cryptococcus yeast may not always be present on cytology to allow for diagnosis. Cryptococcus Antigen testing by Latex Agglutination is also highly sensitive and specific for detection of Cryptococcus. This test is also useful to monitor response to therapy as clinical improvement is often seen before elimination of the yeast, and relapses can occur. Long term therapy (6-12 months or more) is often required. Latex agglutination testing was also performed in this patient to monitor response to treatment, and was initially positive at ≥ 32,768. The patient is doing well clinically and is gaining weight with treatment, and his antigen titer has decreased to 1:8192 four months after initial diagnosis.